Summer time really is the best time to be newly pregnant. I haven’t had much by way of morning sickness at all, but I’ve definitely noticed a preference for certain foods, mainly lots of fresh fruits and vegetables as close to their natural state as possible. Luckily, there’s so many delicious fruits and vegetables to eat right now — much better than being in the first trimester in January and February like I was with Nora! My favorite food right now (aside from The Brotherhood’s lobster rolls) is a watermelon and tomato gazpacho inspired by one occasionally Chris makes at the restaurant. 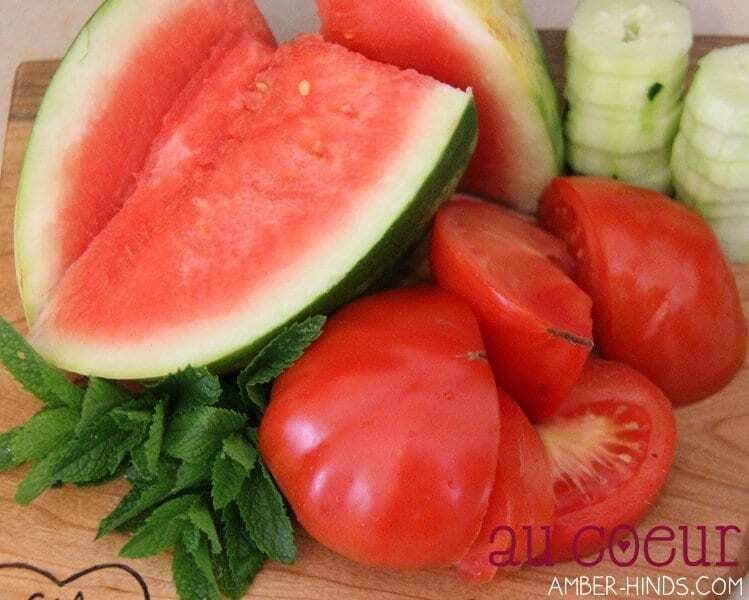 It’s the perfect summer food: easy to make, cool and refreshing on a hot summer day, centered around garden-fresh produce, and easily transported for a picnic or a trip to the beach. 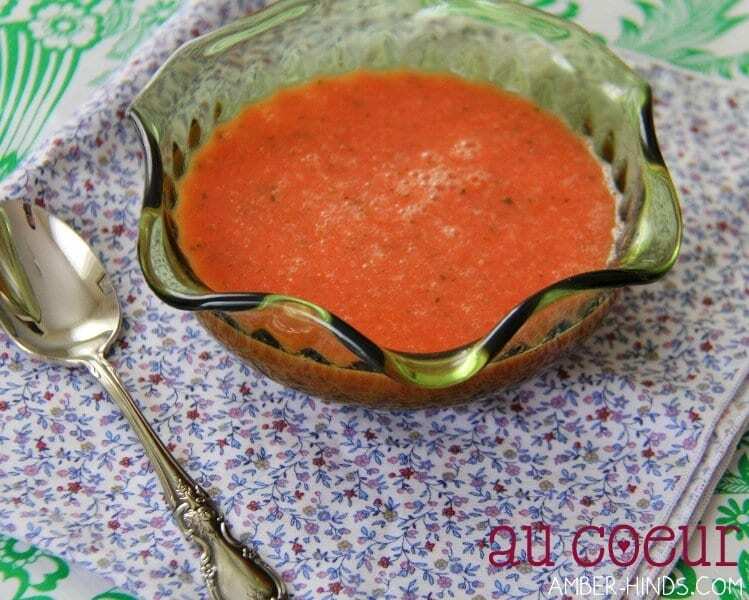 This soup is just lightly sweet and a little minty; besides eating it out of a bowl, I love to sip it smoothie-style and we’ve also been downing gazpacho popsicles! I asked Chris to give me a recipe, but of course he doesn’t have one. He likes to mix things “until they’re combined” and cook them “until they’re done” after eyeballing measurements. How he does that and turns out amazing food is beyond me — I like a little more guidance, so I created my own recipe to follow based on his ingredients. I hope you enjoy it just as much as I do. Chop tomato and watermelon just enough to fit in blender. 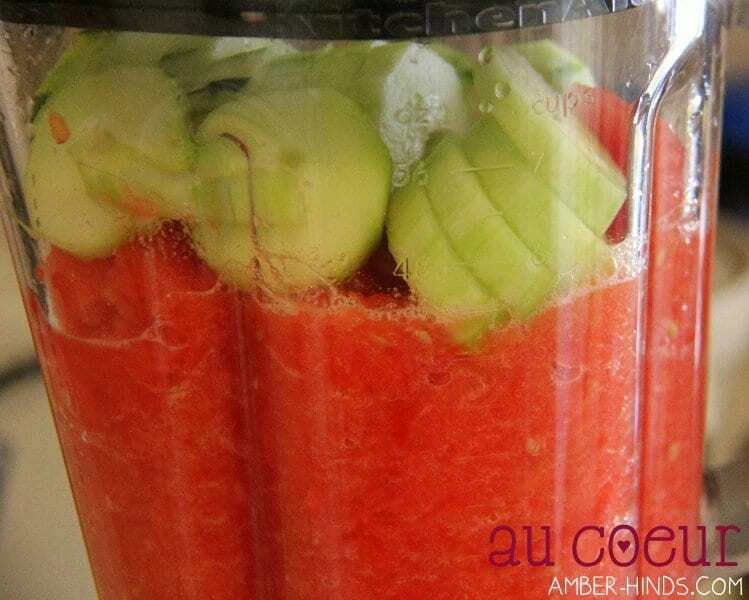 Combine tomato, watermelon, and cucumber in blender and puree. (Depending upon the size of your blender, you may need to puree some of the fruit/vegetables to make room for more.) Add mint, olive oil, salt and sugar. Puree until mint is finely chopped and evenly dispersed. Serve cold and enjoy! Make approximately 7 cups of soup.